My pal Bob sent me an e-mail wondering what gives. After I said “Adios!” to Paladar Cubano, closed last week, he drove by the corner of 90th and Aurora to find the truck still in business. And he wasn’t the only one. The Aurora/Seattle blog since reported the story of new ownership and a new name — Cubano Loco — noting Paladar’s Cubano much sought-after sandwich remained on the menu. So today around noon I took a drive over there in hope of getting my hands on one. No dice. The pleasant fellow operating the truck said he is, in fact, selling the sandwiches, but they were temporarily 86’d (his wife had just run off to get some bread). I had no time to wait, so I asked, “What else have you got?” With no written menu to be found, he offered up tacos, burritos and enchiladas among other typical Seattle taco-truck fare. “It’s Taco Tuesday!” he told me, when tacos cost a buck a piece. I had two. Which, in case you were wondering, were every bit as good as they looked. 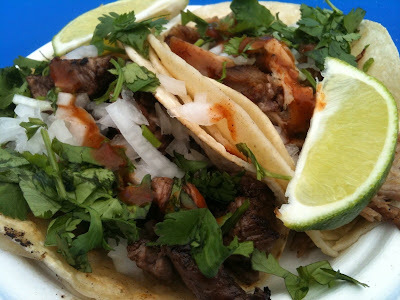 $2 worth of “Taco Tuesday” specials, one with carne asada, the other with carnitas. A squirt of lime, a hit of bottled salsa — Delish! As I was enjoying lunch at the picnic table out front, a crew of construction-worker-types pulled into the parking lot, got out of their trucks and stood there looking as disappointed as I was to see the former Paladar Cubano stripped down and Cubano-less (at least for the moment). But before long, the friendly operator had them convinced to try his burritos. I didn’t stick around long enough to get their critique, but I plan to go back and try Cubano Loco’s version of that other Cubano’s Cubano. If you get there before me, check in back here with a report, OK?